In a quickly organized endeavor, Rep. Dr. Ami Bera held a town hall meeting in Elk Grove last night. The meeting held by the Democratic congressman who represents California's 7th congressional district was conducted before a standing-room-audience in the city council chambers at Elk Grove City Hall. Bera kicked off the meeting by emphasizing constituency services. He noted that his in-district and Washington D.C. staff have been able to help about 10,000 constituents with services. "The thing I am most proud about, is the level of work we have done, staying connected to the community," Bera said. "We have helped now over 10,000 constituents; veterans, seniors, students, folks who needed help with Social Security, veterans benefits." Bera also said his role as the vice ranking minority member of the foreign affairs committee had taken him on worldwide travels and he now has an active role in maintaining relationships with allies. "I don't want the rest of the world to think we are a different country right now," he said. "The message the president sends out when he tweets something when he makes off-the-cuff comments, I find rather embarrassing at times because I don't think that is who we are. I think we have to rise about that." Following the remarks, Bera answered questions submitted in writing covering a wide range of topics. The topics ranged from included immigration, Russian meddling in American elections, healthcare, congressional leadership and the future of Social Security and Medicare. On Russian meddling, Bera noted it is established it did occur. Additionally, he said it does not appear that the actions did not affect the integrity of any election and emphasized the adversarial relationship between the United States and Russia. "Vladimir Putin is not our friend, Russia is not an ally, and that is what is so disturbing about Trump's statement post-Helsinki," he said. "He seems to be the only one who thinks Russia is our friend and seems to hold us accountable or our allies accountable. He seems to never hold Russia accountable. That's disappointing." Bera added that is the Democratic caucus wins the majority following the November midterm elections he will support Congressman Adam Schiff (D - California) as the next chair of the house committee on intelligence. That role is currently is filled by Rep. Devin Nunes (R - California) who has become a lightning rod of controversy in his support of President Trump. In a discussion of healthcare, Bera, who is a physician, said he supports the movement of universal healthcare. He also noted the individual mandate that people have coverage, which was removed by Republicans and Trump, will again push health insurance premiums higher. Although the meeting was not a campaign event, Bera was asked if he would be willing to debate his Republican challenger, Andrew Grant, who was present at the meeting. Two weeks ago Grant challenged Bera to a series of five debates. 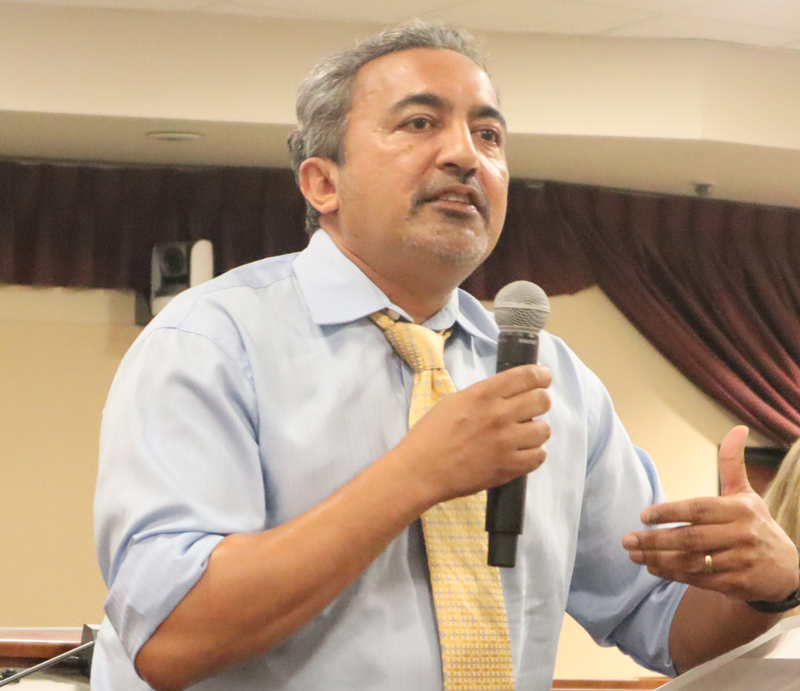 Bera, who has held debates as an incumbent said he would accept the invitation, but did not offer any specifics. He did say the two campaign staffs have been talking and anticipated it could occur in September. "We've always debated, and we certainly are going to debate again," he noted. "Elections are about an exchange of ideas, so voters can get a chance to hear from the candidates." When asked about Social Security and Medicare, Bera said he and the Democratic congressional caucus are doing everything possible to protect benefits. He noted if Republican lose the majority in the midterms, they could try slashing the programs in the lame duck session. Bera also noted outgoing House Speaker Paul Ryan has long sought to make sizable cuts to the popular programs. "We know Paul Ryan is retiring, and that has always been one of his dreams to change Social Security and Medicare," Bera stated. "And I think we've got to hold firm here." The complete audio recording of the meeting is posted below.